Garson Ladies Fellowship was launched at an inaugural luncheon held at Garston Masonic Hall, home to the Garston Group. 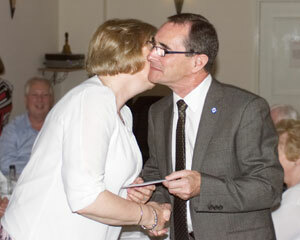 Marilyn receives her gift voucher and congratulations from Keith Williams. The fellowship, which is based on the Broken Column initiative, aims to provide a format for the ladies and widows within the group to meet, enjoy good company and to further develop friendships. It is hoped that four such luncheons will be held each year. The organising of the event was in the capable hands of group charity steward Keith Williams, who has had the guidance of Dave Johnson of the Liverpool Group, and he has worked long and hard in bringing together the day’s event. Going forward it is hoped that the ladies themselves will take over the running of the fellowship and the organising of not just luncheons but additional social activities. Attendance at this initial event was some 23 people,17 of whom were wives and widows of the Garston Group as well as ladies from within the wider West Lancashire Masonic area. Amongst those supporting the event were Garston Group Chairman John Murphy and vice chairman Dave Atkinson. Pre-luncheon drinks were enjoyed in the hall lounge and each lady was given a raffle ticket for a draw to be held later in the afternoon. With everyone gathered in the dining room an enjoyable three course lunch was served, the cost of which, to the ladies, was subsided by the kindness of The West Lancashire Freemasons Charity. Following the luncheon Keith outlined to the ladies the aims of the fellowship, advised of future events and requested volunteers from the ladies to take on the running of the future activities. Concluding the afternoon, the draw took place and Keith was pleased to present the winning lady, Mrs Marilyn Duggan, with a gift voucher. The ladies enjoy their lunch and a chat. Next:End of an era at Lancaster!